In this tutorial, I'll show you how to improve your portraits by giving your subject beautifully smooth skin with Photoshop! 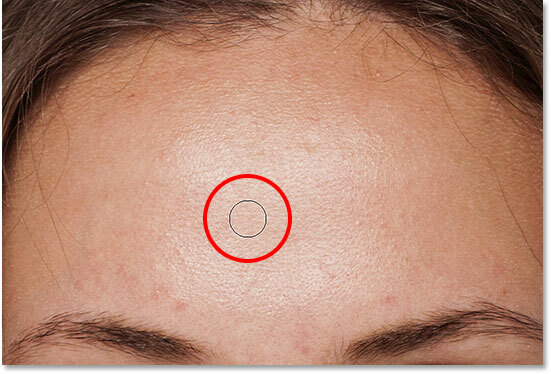 We'll start by learning how to remove pimples and other minor skin blemishes using Photoshop's Spot Healing Brush. Then, after the initial clean-up, we'll learn step-by-step how to smooth and soften skin without blurring important details, like the person's eyes, hair and so on, and while keeping as much good skin texture as possible. I'll be using Photoshop CC but this tutorial is fully compatible with Photoshop CS6 and earlier. A close-up of the original. 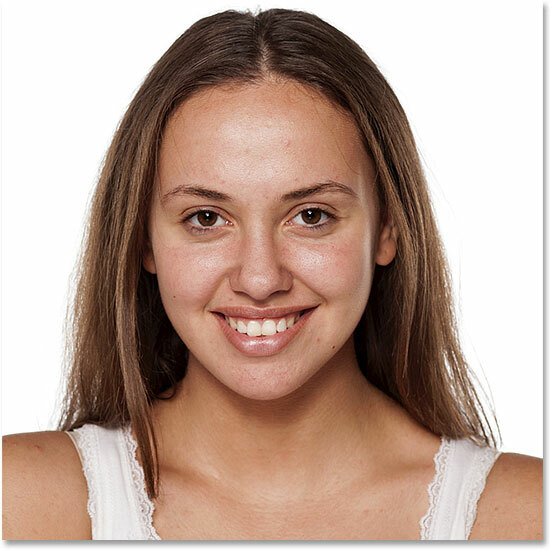 This tutorial is part of our Photo Retouching collection. Let's get started! 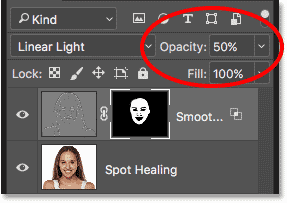 Naming the layer "Spot Healing". The initial skin cleanup will now be done on a separate layer. Selecting the Spot Healing Brush. Step 3: Set The Spot Healing Brush To "Content-Aware"
Click on any unwanted skin blemishes with the Spot Healing Brush to remove them. 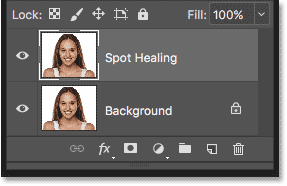 Photoshop will instantly "heal" the blemishes by replacing the problem texture with good skin texture from the surrounding area. For best results, make your brush slightly larger than the blemish. To change your brush size, press the right bracket key ( ] ) on your keyboard to make the brush larger or the left bracket key ( [ ) to make it smaller. If the blemish hasn't completely gone away on the first try, undo your click by pressing Ctrl+Z (Win) / Command+Z (Mac) on your keyboard, then resize your brush if needed and click on the same blemish to try again. Positioning the Spot Healing Brush over a skin blemish. Clicking to heal the blemish. Positioning the Spot Healing Brush over a second blemish. The second blemish is gone. The blemishes have been removed from her forehead. As you're retouching the skin, keep in mind that while it's okay to remove temporary problems like acne or other minor skin issues, it's usually not okay to remove permanent features like moles or even certain scars, as these are part of what makes someone who they are. 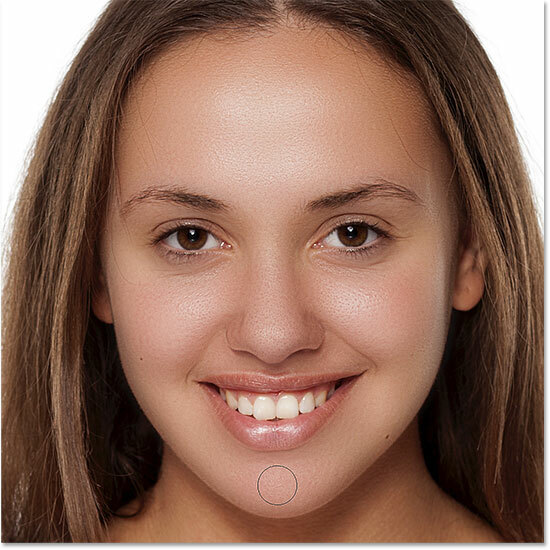 After all, the goal of image retouching is to help people look their best, not to make them look like someone else. 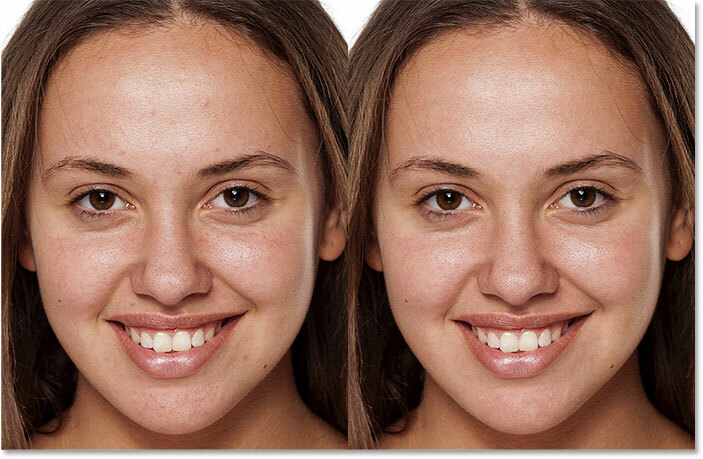 A before (left) and after (right) comparison of the initial skin retouching. 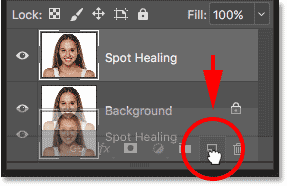 Duplicating the "Spot Healing" layer. 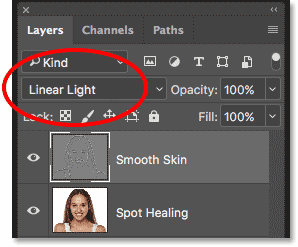 Naming the duplicate layer "Smooth Skin". The "Smooth Skin" layer appears above the "Spot Healing" layer. 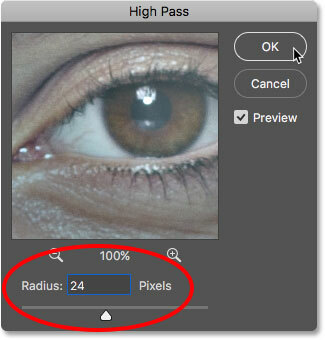 If you're familiar with the High Pass filter, it's most likely because you've used it to sharpen images in Photoshop. Even though we'll be using High Pass to smooth skin, not sharpen it, many of the steps are the same. The High Pass filter looks for edges in the image and highlights them. An edge is an area where there's a big, sudden change in brightness or color between neighboring pixels. 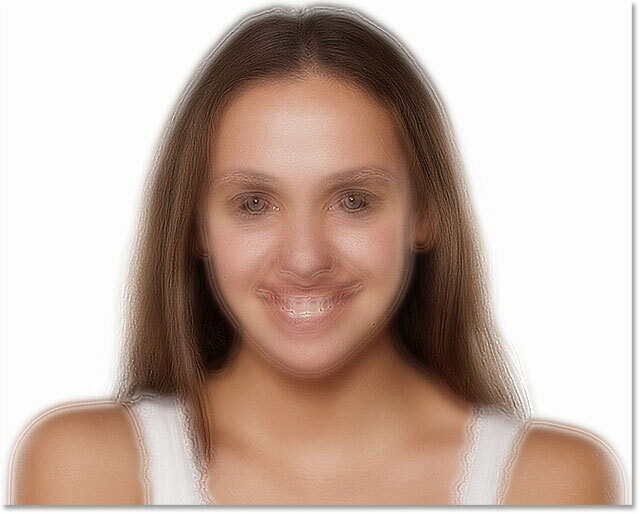 With portrait photos, the edges are usually along the person's hair, around the eyes, the mouth, and so on. Skin texture, on the other hand, has relatively low amounts of detail with much smoother transitions. 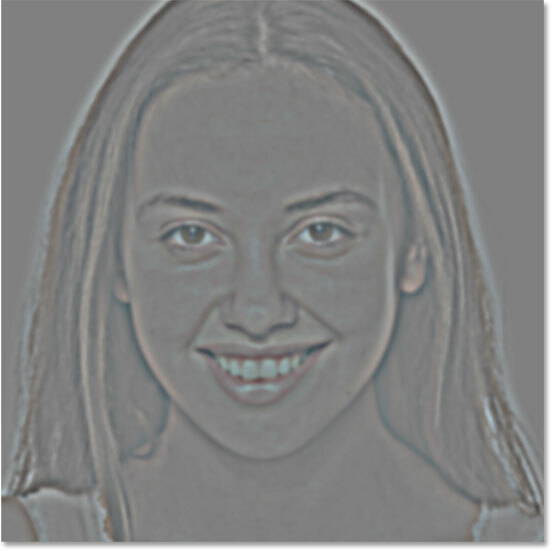 These areas are not considered an edge, so rather than highlighting them, the High Pass filter fills these areas with neutral gray. If we were sharpening the image, the High Pass filter would allow us to sharpen the edges (the details) without affecting the skin. But for smoothing skin, we use High Pass for the opposite reason. We'll detect the edges not so we can sharpen them but so we can smooth and soften everything except the edges. Let's see how it works. Setting the Radius value to 24 pixels. 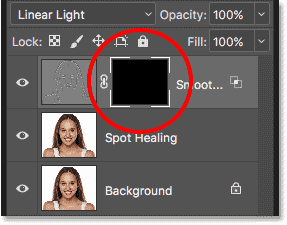 If your subject is further back in the photo, or you're working on a lower resolution image, a smaller Radius value of 18 pixels or even 12 pixels might work better. Why these specific values? It's because it's important for the next step that you choose a Radius value that's easily divisible by 3. For example, 24 divided by 3 is 8, 18 divided by 3 is 6, and 12 divided by 3 is 4. Nice, easy numbers. Again, we'll see why in the next step. The result after applying the High Pass filter. 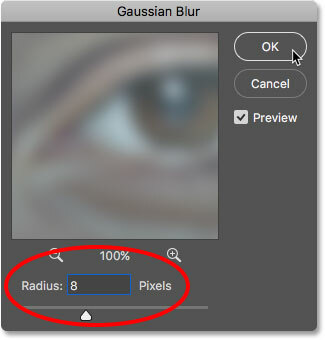 Setting the Gaussian Blur radius to one third of the High Pass radius. Changing the layer blend mode. 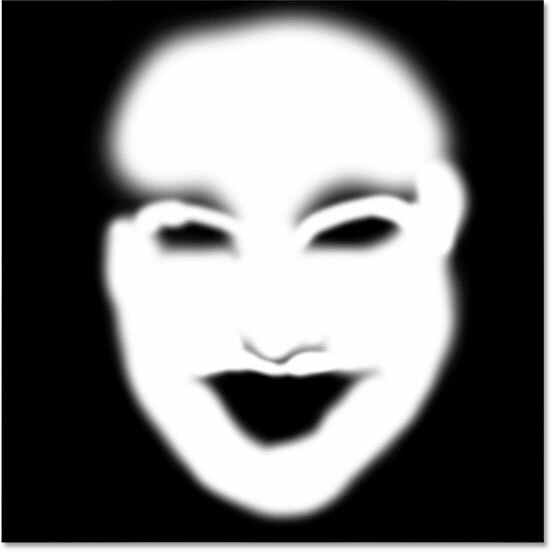 The image after changing the Smooth Skin layer's blend mode to Linear Light. The result after inverting the "Smooth Skin" layer. The dark (left) and light (right) sliders. Dragging the left half of the slider on the right. The lighter halos are gone after dragging the slider on the right. Dragging the right half of the slider on the left. The darker halos are gone after dragging the slider on the left. 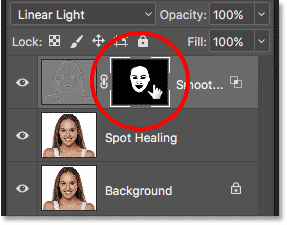 Adding a layer mask while holding Alt (Win) / Option (Mac). A black-filled layer mask has been added to the "Smooth Skin" layer. The Foreground color (the brush color) should be white. Making sure the Mode, Opacity and Fill options are all set to their defaults. Then paint over the skin to reveal the smoothing effect. A soft-edge brush will work best. We already know that we can change the brush size from the keyboard using the left and right bracket keys. Add the Shift key to change the brush hardness. Press Shift and the left bracket key to make the brush softer, or Shift and the right bracket key to make the brush harder. Bringing back the smooth skin in the woman's forehead. Revealing more of the smoothing effect, but just over the skin. Revealing the smooth skin in the lower areas of her face. 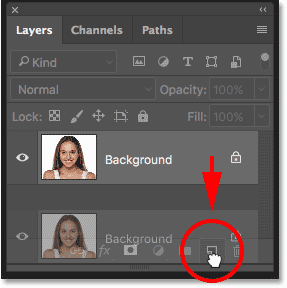 Holding Alt (Win) / Option (Mac) and clicking the layer mask thumbnail. Use the mask view to look for any areas you missed. Lowering the opacity of the skin softening effect to 50%. The final skin smoothing result. And there we have it! 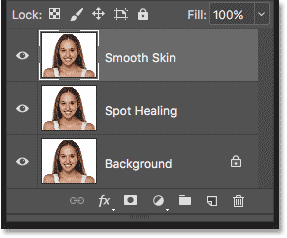 That's how to easily smooth and soften skin in Photoshop! For more portrait retouching tutorials, learn how to reduce wrinkles, how to change eye color or how to whiten teeth with Photoshop! Or visit our Photo Retouching section for more tutorials!